Anyone can learn how to make use of the healing philosophy and techniques in this book to control pain and accelerate healing, and it can be easily understood and used by the patient. Because of the air of power and mystery surrounding hypnosis, the media often use creative license in presenting it, leaving the public with a distorted view of what hypnosis is, and what happens in a hypnotic state. These portrayals have given rise to some common myths and misconceptions. 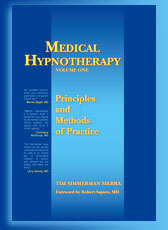 Medical Hypnotherapy, volume 1, dispels the myths and shows how clinical hypnosis is an essential tool for helping people discover and activate their own inherent self-healing capacity. As one of the few hypnotherapy instructors in the nation to be trained in allopathic medicine, Tim can help you understand the appropriate adjunctive use of clinical hypnosis. In this book, he puts a laser focus on the most effective methods to relieve pain and speed healing. Tim Simmerman Sierra is a retired nationally registered paramedic, who was trained at the University of New Mexico, School of Medicine and has been a clinical hypnotherapy instructor since 1995. He is known internationally as one of America's top hypnotherapy trainers. He is lead instructor at the Hypnotherapy Academy of Amercia, and his methods are used by the National Institutes of Health for scientific research purposes. Tim is a past president of the American Council of Hypnotist Examiners, and currently on the Board of Directors of the International Board of Hypnotherapy, as well as the Global Hypnotherapy Advancement Foundation.